Much of the information below comes from the research1 of Dr. David Gillespie (Agriculture and Agri-Food Canada) and his team in British Columbia, Canada. 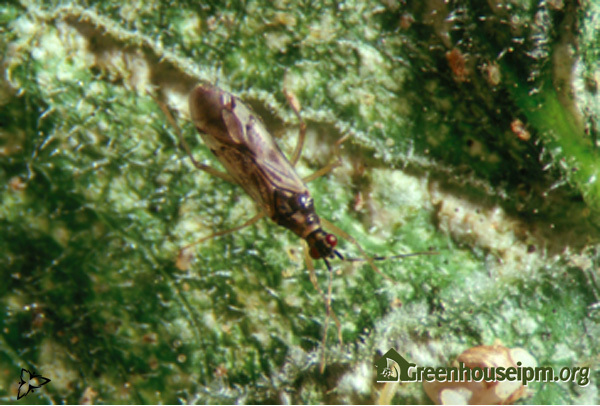 It should be noted that as of June 2011, Dicyphus cultures are not being produced by any of the major biocontrol producers, although small cultures are being maintained privately in British Columbia and Quebec for local use. Dicyphus was developed as a biocontrol agent in North America to fill a similar role to that occupied by the predator Macrolophus in Europe. Macrolophus is not native in North America and is not allowed to be imported. Dicyphus is a predatory bug with piercing/sucking mouth-parts. These bugs are generalist feeders but they appear to have a preference for whiteflies and mites. They have also been observed feeding on moth eggs and potato psyllids, but no trials have been done to assess whether they will provide control of other pests. Dicyphus is omnivorous, feeding on both plants and animals. Adults are about 6 mm long, initially green and then later on, blackish with mottled semi-transparent, cream-coloured wings, and banded antennae (Figure 1A, 1B). They have red eyes, and an elongated shape similar to that of Macrolophus caliginosus. Nymphs are green and have red eyes with a red stripe behind the eyes. The life cycle consists of the egg, which is embedded within plant tissue, 4 nymphal stages, and the adult male and female. Dicyphus development from egg to adult takes 43 days at 19oC, 33.5 at 22 oC and approximately 25 days at 27oC. The number of eggs laid depends on environment including food source, temperature and day length, but in one study, females laid an average of 175 eggs over a 9 week life span. All mobile stages are omnivorous and they must obtain water from plants to complete development and reproduce2. Because of the lack of commercial production at the moment, there is little currently available information on packaging and distribution methods. However, in general terms, Dicyphus should be released as soon as whiteflies are found; make releases in batches of about 100 adults directly in infested areas; releases should be repeated in 2-3 weeks. 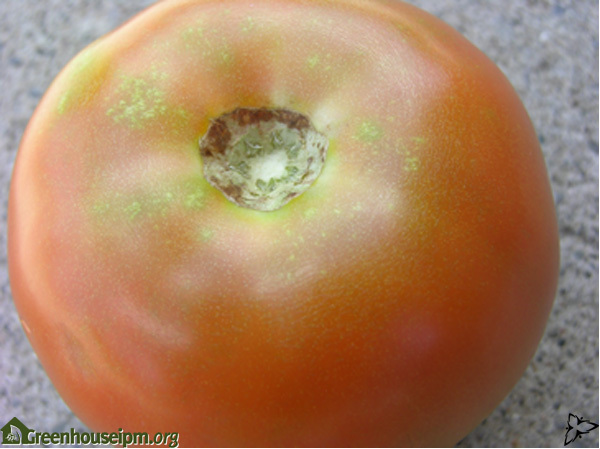 Refer to the Refer to the Grower Guide: quality assurance of biocontrol products to determine the quality of the Dicyphus at receipt at the greenhouse. Gillespie et al. suggested introduction rates between 0.5-2/m2/week, noting that establishment takes at least 6 weeks. It may help establishment in the absence of large whitefly populations to add a supplementary food such as moth eggs (Ephestia) which are sold by some biocontrol producers. For management of whiteflies, it is best to use Dicyphus in conjunction with the parasitic wasps, Encarsia formosa and Eretmocerus eremicus. 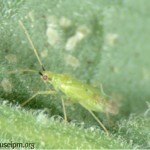 The use of banker plants such as mullein (Verbascum thapsus) may assist in the establishment of this predator when whitefly population densities are low3. 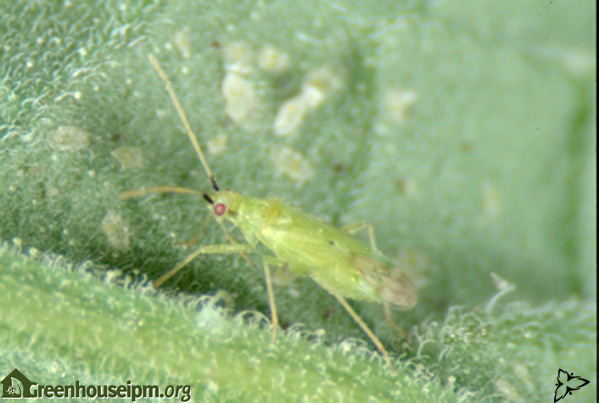 Dicyphus feeds on the mullein plant and can develop and reproduce on it (Figure 2). The strain of Dicyphus that was in commercial production was non-diapausing so it was suitable for use year-round. It can be assumed that any local non-commercial production which was built on product obtained from commercial insectaries, is also non-diapausing. Examine plants with as little movement of the plant as possible because adults and nymphs move quickly and hide in the plant when such disturbed. On tomatoes, adults and nymphs are often found on the mid-canopy leaves. 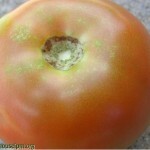 Feeding damage can occur to tomato plants and fruits if food supply is low and Dicyphus numbers exceed about 100/plant. (Figure 3). There is also the potential for damage to flower crops such as gerbera based on reports of damage by the predator Macrolophus in Europe4, which has a similar insect/plant diet. However, Dicyphus has not been widely used in gerbera in Canada, so there is little information available. 1Gillespie D.R., Sanchez A., McGregor R., Quiring D. 2001. 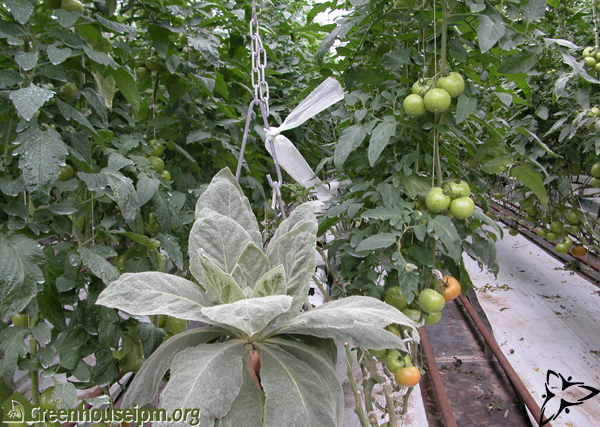 Dicyphus hesperus: Life history, biology and application in tomato greenhouses. Technical Report #166. Agriculture and Agri-Food Canada. 3Lambert L., Chouffot T., Turcotte G., Lemieux M., Moreau, J. 2005. 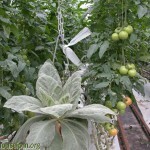 Biological control of greenhouse whitefly (Trialeurodes vaporariorum) on interplanted tomato crops with and without supplemental lighting using Dicyphus hesperus (Quebec, Canada). IOBC/wprs Bulletin, 28(1): 175-178.